Share the post "Advantages of Embolization"
If you’re interested in having children, fibroid embolization makes good sense. A hysterectomy obviously ends any chance of getting pregnant. Fibroid surgeries like myomectomy may cause uterine scarring and impact the ability conceive. 50% of all myomectomy patients experience fibroid regrowth. The window for having a fibroid-free uterus, optimal for pregnancy, is often less than a year. Fibroid embolization preserves fertility. It won’t interfere with the womb or remove any of its tissue. There’s no fibroid re-growth, so you can get pregnant when you are ready, rather than racing against a fibroid re-occurrence. Fibroid embolization means that patients of child-bearing age who want to conceive, generally can. Over 80 women in our practice have had normal pregnancies and healthy babies following this procedure. A major difference between fibroid embolization and traditional fibroid surgeries (like myomectomy) is that embolization ensures fibroids can never grow back. Fibroids removed surgically often leave enough fibroid cells and fibroid tissue to eventually regenerate. 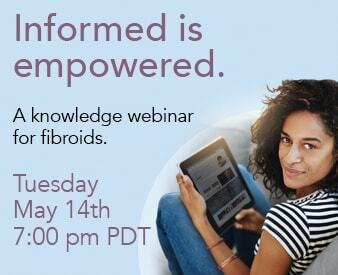 50% of the time, women who have myomectomies discover their fibroids are back in less than a year. Fibroid embolization stops the blood supply carrying oxygen and nutrients to the fibroid, without a blood supply, fibroids can’t live, grow or reoccur. Embolization stops fibroid-related pain and excessive bleeding instantly. While it will take a few months for the fibroids to completely shrink, most prominent symptoms associated with fibroid discomfort are gone immediately after the procedure. Once fibroids are deprived of a blood supply, they stop growing and starve. As they shrink, so will fibroid-related abdomen ‘bloat’.